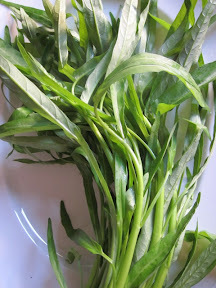 One of the most common vegetable in Asian kitchens is this Morning Glory or some people call them water spinach. You will find them in Stir-Fry with oyster sauce, in noodle soup or along with other vegetables in the hot pot. Morning Glory is easily grown and available everywhere inexpensively. They are also famous for their high in minerals especially Vitamin A and we teach the children in Kindergarten that if anyone wants to have beautiful eyes they should eat Morning Glory.